Game Commission to issue 13,000 permits for antlerless deer within Disease Management Area 2.
deer within Disease Management Area 2. Responding to a need identified by the Pennsylvania Board of Game Commissioners, the permits seek to focus hunting pressure inside the Disease Management Area (DMA), where deer numbers must be kept in check to slow the potential spread of chronic wasting disease (CWD). At the same time, the permit system enables the Game Commission to avoid a reduction in the deer herd in the area surrounding DMA 2 – where CWD has not been detected. DMA 2 includes parts of Bedford, Blair, Huntingdon, Cambria and Fulton counties. The DMA lies within Wildlife Management Units 4A, 4D and 2C (WMUs 4A, 4D and 2C). “We hope the creation of this permit will better help to satisfy objectives of addressing the deer population within the DMA and outside it,” said Game Commission Executive Director R. Matthew Hough. “Our appointed Game Commissioners continually seek input from the hunters and trappers in their respective regions, and hunters in WMU 4A – a large portion of which is within the DMA – have been requesting an increase in deer numbers. There are some differences between the application process for a DMA 2 permit and that for an antlerless license. Only residents and nonresidents ages 12 and older with valid general hunting licenses may apply for permits. Participants in Mentored Youth and Mentored Adult hunting programs are ineligible to make application, and the permits cannot be transferred to participants in those programs. Applications for DMA 2 permits will be accepted in two ways – electronically through the Game Commission’s Outdoor Shop, or by mail. The Outdoor Shop can be accessed at www.theoutdoorshop.state.pa.us. Those wishing to send applications by mail can obtain an application form at the Game Commission’s website, the agency’s Harrisburg headquarters or any region office. The application schedule is similar to that for antlerless deer licenses, however, residents and nonresidents can apply on the same dates in all rounds.Applications will be accepted beginning July 14. Each eligible applicant may submit one application during this first round, which lasts three weeks. Beginning Aug. 4, a second round of application begins. Again in the second round, each eligible applicant may submit one application. However, an applicant who did not submit an application during the first round may submit two during the second round. A third round of applications will begin Aug. 18. Eligible applicants may submit an unlimited number of applications during this round, and the round will continue until all permits have been issued. DMA 2 permits must be used within DMA 2. These antlerless deer permits can be used during any deer season, including the antlered deer season. Those who are issued DMA 2 permits are required to submit reports, regardless of whether they harvest a deer. Harvests must be reported within 10 days. Nonharvests must be reported by Feb. 5. Those who fail to report as required are subject to criminal prosecution and may be ineligible to apply for permits if the program is continued the following year. Through their reports, hunters provide valuable data that plays a crucial role in the Game Commission’s management of CWD. DMA 2 was established in 2013 after three hunter-harvested deer in Blair and Bedford counties tested positive for CWD. The DMA was expanded earlier this year in response to two additional deer killed on highways in Bedford County, and a hunter-harvested deer nearby in Maryland, tested positive. DMA 2 now extends south to the Maryland border. South of the Pennsylvania Turnpike, the western boundary of DMA 2 is state Route 96. The new boundary extends east to state routes 829 and 915, and Interstate 70. The DMA extends as far north as the intersection of state Route 453 and Interstate 99. A map of the newly expanded DMA 2 is available on the CWD Information page at the Game Commission’s website, www.pgc.state.pa.us. A detailed description of the exact boundary, which includes roads other than those listed, is provided on Page 51 of the 2014-15 Pennsylvania Hunting & Trapping Digest issued to hunters at the time they purchase their 2014-15 licenses. Hunters harvesting deer within any DMA are not permitted to remove from the DMA any deer parts with a high risk of transmitting the disease. There are a few exceptions to this rule, including taking a deer to an approved deer processor or taxidermist outside the DMA, or traveling to an approved laboratory for disease testing.The use of urine-based deer attractants also is prohibited within any DMA, as is the direct or indirect feeding of deer. A complete list of rules applying to DMAs can be found in a Game Commission executive order, which also is available at the agency’s website. While chronic wasting disease is relatively new to Pennsylvania, it is not a new disease. CWD was discovered in 1967, and it has spread to 22 states and two Canadian provinces. Scientists believe CWD is caused by an agent capable of transforming normal brain proteins into an abnormal form. CWD affects members of the cervid, or deer family. It is spread from animal to animal by direct and indirect contact. There currently is no practical way to test live animals for CWD, nor is there an approved vaccine to prevent infection. CWD is a slow-progressing disease and clinical signs do not develop until later stages of disease, often two years or more after infection. Clinical signs include poor posture, lowered head and ears, uncoordinated movement, rough-hair coat, weight loss, increased thirst, excessive drooling, and, ultimately death. Any animals suspected of having CWD should be reported to the Game Commission. There currently is no scientific evidence that CWD has or can spread to humans, either through contact with infected animals or by eating the meat of infected animals. As a precaution, however, people are advised not to consume meat from animals that test positive for CWD. 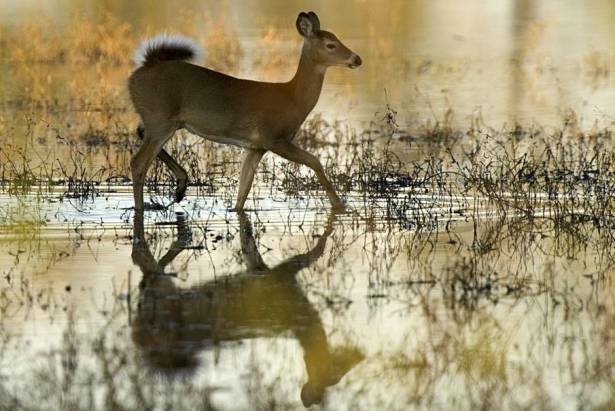 During 2013, the Game Commission collected and tested samples from 5,120 deer statewide. 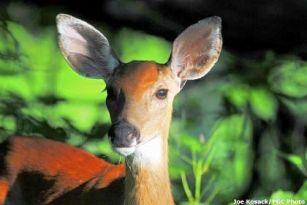 Only the two from Bedford County tested positive for CWD. Since 1998, the Game Commission has gathered and submitted more than 48,000 samples from wild deer and elk for CWD testing. A total of five free-ranging deer have tested positive – all of them within DMA 2.